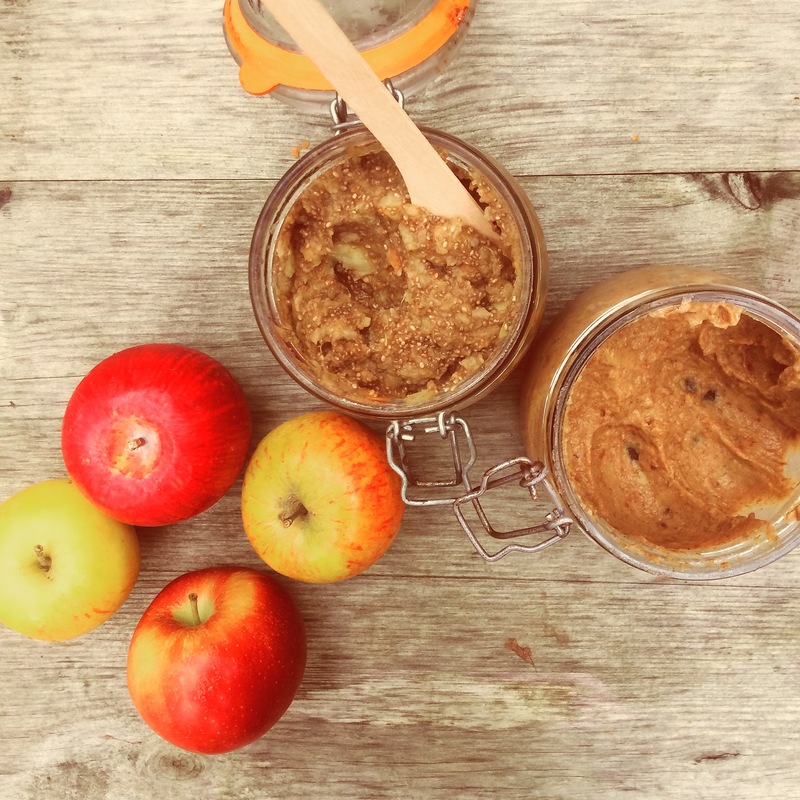 Make the most of the last of your apple pickings this Autumn with these comforting and nutritious spreads. They’re both high in plant protein thanks to the almonds and chia seeds, and the naturally sweet apples and dates means there’s absolutely no need for sugar. How nutritious the thing you choose to spread these on however, is up to you……..
Cook and soften the apples by placing them in a pan and just covering with water. Bring to a boil and then simmer for about 15-20 minutes, or until the apples are soft. When cooked, place the ‘mush’ into a food processor or blender, removing as much excess water as you can, (save the sweet apple water for drinking if you like). Add your chia seeds, vanilla extract and cinnamon. Pulse a few times to combine everything so the mixture becomes smooth, but with a few small chunks of apple remaining. Place in a bowl or Mason jar, separate into recycled jam jars to give as gifts. While the apples are cooking, soak the dates in warm water. They don’t need to be completely soft, but this will allow for a smoother consistency when blending the mixture. When cooked, place the ‘mush’ into a food processor or blender, removing as much excess water as you can (again, save the sweet, warm apple water for natural apple juice or even home made spiced apple cider – recipe coming soon). Add your dates, almond butter and vanilla. Blend or pulse until everything is smooth and well combined. Scoop into a Mason jar, bowl or separate into recycled jam jars to give as gifts.